I’m looking forward to this pattern being available. This is a really cute version. I’m also a huge fan of that shade of green! Very cute – I would never have thought of that colour combo but you are rocking it! 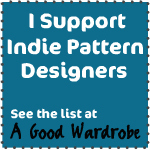 Congrats on being selected as a pattern tester too; Tasia’s work is so inspiring. I recently found your website web page on the internet in addition to check out a few of the early posts. Preserve in the very good perform. I simply more up your Feed to help our Windows live messenger Information Audience. Looking for toward looking through much more of your stuff afterwards! L K Tucker, Forgive me but you’re case looses a lot of validity when you send me to a site with no information but littered with ads and conspiracy theories. Since you’re to lazy to refer me to a peer reviewed study, I’m too lazy to go looking for one.